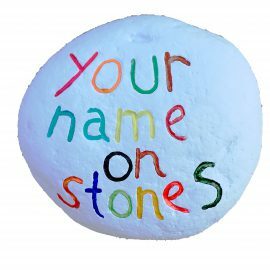 I collect stones since many years, my idea was to write over them a name of a person, a country name or some sentences about life, love and so on…. I collect stones since many years, my idea was to write over them a name of a person, a country name or some sentences about life, love and so on. Like as a diamant for me a stone is forever. Many friends of mine began to ask me to made a stone for someone important in their lives or just for themselves to put it on the table or in the bag, others ask me stones for wedding guests, If you want to make a simple and unusual present with a name on a stone ( simple stone to put on the table or to put on a wall glued to a piece of wood ) just contact me and I will write as soon as possible. Prices will be different and it will be fixed after your reservation.